Last week I posted Noodle Roll, which had a lot of clever thematic elements like creating "strands" of identical dice results or employing sous-chefs to compensate for sub-optimal rolls. Where that theme fell down was in the big group board. Exciting. What the heck is this supposed to be anyway? Mechanically speaking, the board featured columns and rows of spaces in which you were to place cubes. 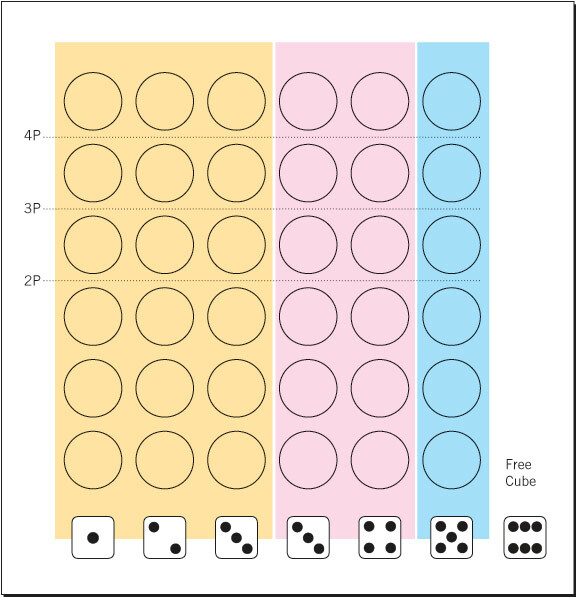 Pairs of horizontally adjacent cubes in the same color-coded area granted you a 10pt bonus. One area had three columns, enough room for two pairs. The middle area had only two columns, room for one pair. The last area had only one column, meaning there was no room for any pairs. When I came up with this board, I didn't really bother thinking about a thematic reason for its layout at the time. I just liked the clever adjacency mechanic. I hand-waved that these areas represented restaurants with broad or specialized menus. You played workers at a noodle factory delivering shipments of noodles to those restaurants. Yeah, it's about as exciting as it sounds. This is a problem I have. I take the game's perspective too high up. This tends to make very abstract, impenetrable themes that only die-hard Euro gamers would find interesting (maybe). What's worse is that in the case of Noodle Roll, it didn't even explain the adjacency bonus very well. Time for a revision. So, in continuing discussions Lyndsay Peters and jcdietrich, it made more sense for the game to focus on one restaurant that served many different noodle dishes, like Noodles & Co. The group board is now a floor plan of that restaurant. 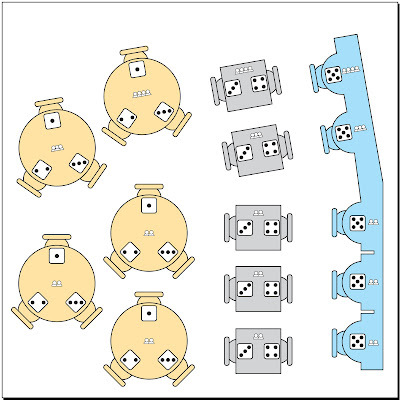 Instead of columns and rows, the floorplan is divided into three-seat round tables with place settings for noodles 1, 2, and 3; two-seat booths with place settings for noodles 3 and 4; and one-seat counters with place settings for noodle 5. Now placing a cube represents serving a diner in the restaurant. The "adjacency bonus" comes from serving the same table multiple times. Now it makes more sense why players would compete to fill those table's orders fast. The adjacency bonus is a tip. With this new board, the "6" could represent the manager, who isn't as efficient as the actual wait staff but can serve any table at any time. This board could easily have modular effects for each table as well. There are numerous things to do at a restaurant that my evoke some cool mechanical effects. What is the mechanical effect of refilling a diner's water glass? It must be some modest benefit that doesn't interfere with other players, but is always available. Maybe turn order? What is the mechanical effect of appetizers? Maybe it's a type of cube that you can play first, followed by an entree cube, then a dessert cube, but only in that order? What is the mechanical effect of taking dishwashing duties? Maybe it's an ability to ignore one roll, as if starting from a clean slate? Anyway, this already feels like it's going in a better direction. It's always nice to take some cues from the theme to make the game more accessible and strategically interesting, without making it simulation for simulation's sake. Perhaps the appetizer mechanic could equate to a special cube that can be used to claim a diner/spot. Roll a pair of the same number, and instead of using sous-chefs to make it a run of three, you can use your one appetizer cube, which would allow you to secure that spot for yourself, securing an adjacency bonus or blocking an opponent's. Downside is you only have the one cube, and can't move it willy-nilly. Wow, very cool Daniel! I am a euro gamer at heart, but the new layout would totally sell the game's theme to me. Building off the appetizer idea, perhaps water refills are a less aggressive form of place-holder. You have one (or two, or three) Water cubes in your colour. 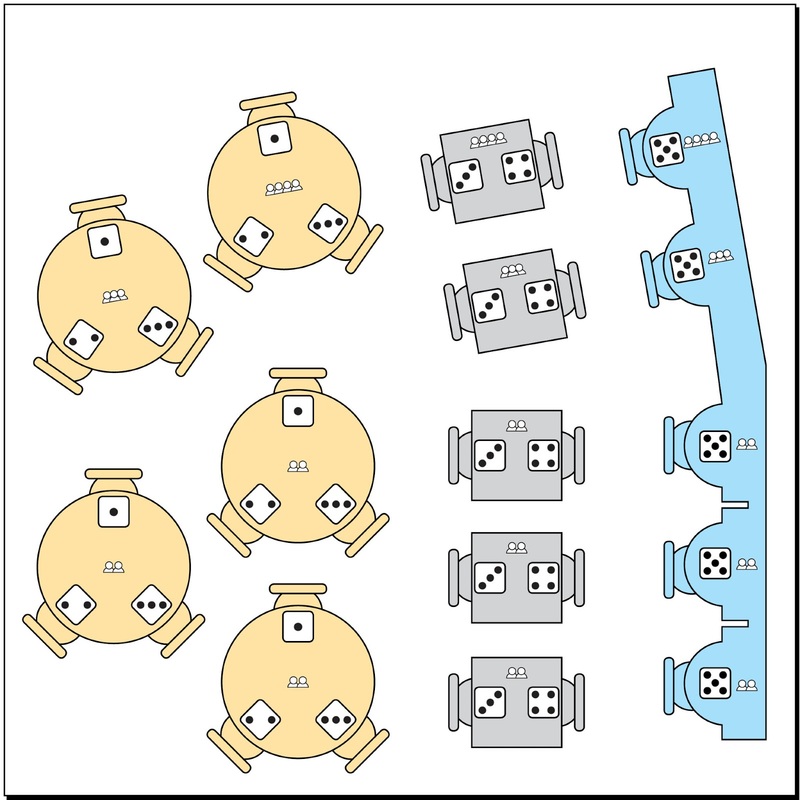 When you roll a set of 4, you may keep use that fourth die to refill water at that table/column. Refilling water "banks" that fourth die to use if you roll a pair in a subsequent roll. i.e. You roll 4 2's. You can serve a meal to the 2 seat at a 3-top, and use that 4th 2 to place a water glass cube on the 1 seat at the table. 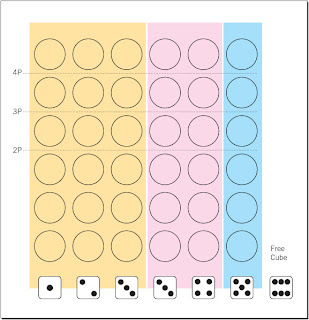 Next time you roll a pair of 1's, you can use that waterglass cube to complete the trio. But water doesn't prevent a meal from being served, the way an appetizer does. Someone can swoop in and place a meal at that table, returning your water cube to your supply. Not trying to design your game for you, just thinking about your bonus points for a run of 4, from your early discussions of these mechanics. Here's a potential bonus effect for rolling a set of 4. This is a very cool idea! And yeah, I'm looking for ways to "layer" the area control mechanics in the game so there are some more meaningful long-term choices.